Buying high quality tuna is a MUST...it needs to be bright red, not pink (or gray...ew!). The color ensures that it is fresh, and though it is more expensive, it is defintiely worth it. The fresh ginger and wasabi made the flavors really come together...also, there was a TASTY mayo that was excellent. I normally don't eat mayo, but this was killer! Combine the wasabi, mustard, and water in a small bowl. Scrape it into a food processor along with the pepper, salt, ginger, garlic and peanut oil. Pulse it all together to make a flavorful paste. Add the tuna and pulse just to combine--be careful not to overprocess the tuna as you want your burgers to have texture. Form the mixture into 4 burgers and set in the refrigerator for at least one hour (up to overnight) to let the flavors really settle in. Meanwhile, heat the the olive oil over medium-high heat in a skillet. Add the shallots and sauté for about 10 minutes, until the get soft and sweet and a little brown. Reserve. 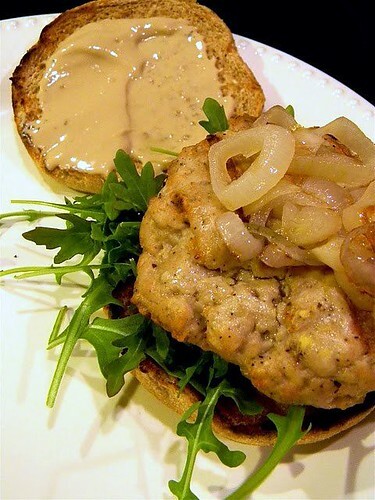 Rub the tuna burgers with a little peanut oil and grill for 2 or 3 minutes a side, to desired doneness. Grill the buns alongside the burgers. 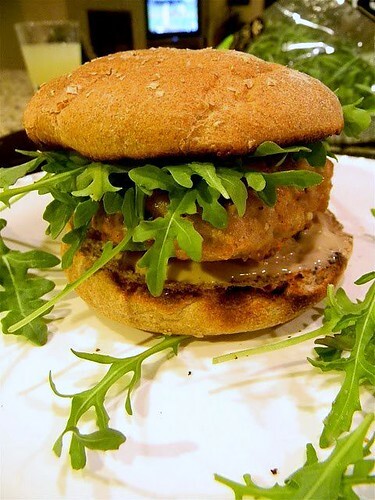 Spread the buns with the mayo, pile on the sautéed shallots and a bit of the arugula, and tuck in the burgers. Did you make anything fun for the long weekend? Hope you enjoy these! Bon Appetit! OMG this looks AMAZING! I would love this for lunch today! yum yum yummm! I have been meaning to try this recipe. Looks so good! Yeah! I am glad you liked them and they turned out well! The mayo really makes the burgers! Hope you had a great weekend. These look SO yummy - we will definitely be trying them :) I love wasabi and ginger! That looks so good, I love seafood on a sandwich, all of it, any of it! This looks delish!! I love tuna and arugula! Such a fresh taste for Memorial Day Weekend! Totally have this bookmarked! yum! This tuna burger looks tasty! I don't think I've ever had one. I know you're not necessarily looking for photo advice, but if you use photo processing software (Picnik, through Flickr, is free), you should be able to adjust the yellow-tones of photos you take in indoor lighting. Additionally, if you're using a point-and-shoot you might be able to adjust the white balance to make the colors look a bit more natural. My dad loves tuna. I think I need to makes these for fathers day! oh yum! i love tuna but got a little burned out on tuna salad....these look really fresh and healthy! I'M STARVING NOW!!!! haha geeesh these look so yummy! :) thanks for sharing! YUM! These look delish! You always have the best recipes! 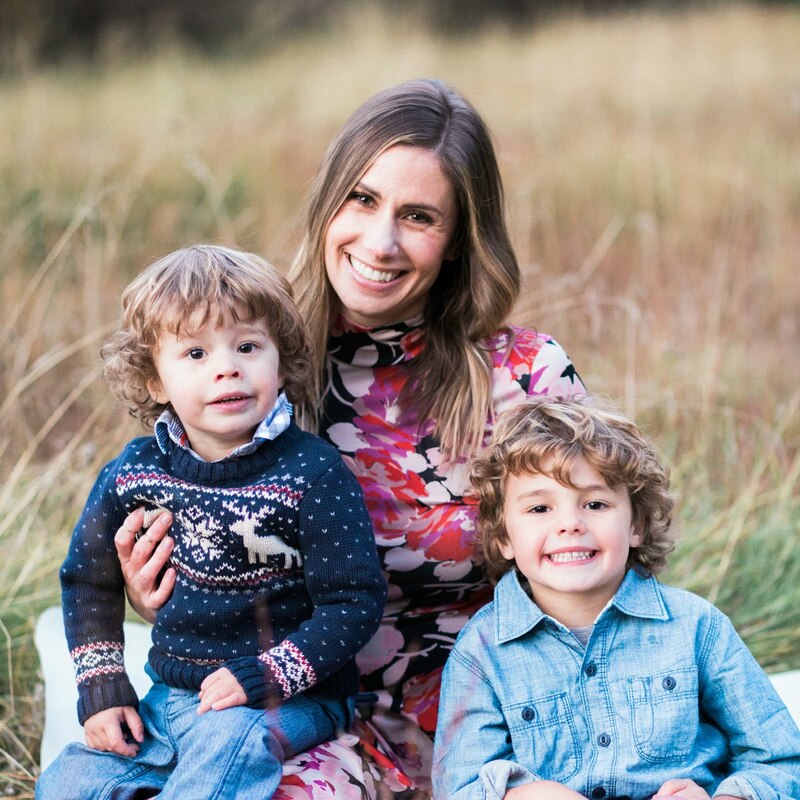 I hope you had a wonderful weekend! Yum o! I'm hungry now! LOVE tuna burgers!! So yummy and healthy! !